When the words “muscle car” come to mind, one usually thinks of powerful V8 powered rear-wheel drive cars. In most cases this assumption would be correct. However when the plug got pulled on high-performance muscle car engines in the form of government emission regulations and skyrocketing fuel prices in the 1970s – performance was severely hampered. By the mid 1970s the last remaining muscle cars, were shadows of their former selves. Many still paraded around in the livery (decals, stripes, and spoilers) that their predecessors had, but they were nothing more than paper tigers. 5) 1980 AMC Spirit AMX (4.2 liter I6) – AMC’s heart was in the right place but you have to wonder what they were thinking when the 1980 AMC AMX was rolled out with its only available motor being the 4.2 liter 2-barrel carbureted I6. This motor was reliable but with its low output of 110 horsepower and good low-end torque (195 lbs/ft at a very low 2000 rpm) it was better suited for duty in AMC’s Jeep lineup. The 4.2 liter I6 served reliably for many more years. The AMC 4.0 liter I6 which was a modified version of the 4.2 liter was introduced for 1987 and continued service in Jeeps until the production end of the TJ body Wrangler in 2006. As solid and proven as the 4.2 liter I6 was, it was ill suited to power a car with the legendary AMX nameplate. The AMC AMX saw duty from 1968-1970 as a 2-seater shortened wheelbase version of the sporty Javelin. It was AMC’s flagship muscle car during these years. Unfortunately it was short lived, and was cancelled at the end of the 1970 model year. The AMX then had a short life thereafter as a decor option on the 4-seat Javelin. When the Javelin was sent to car heaven at the end of the 1974 model year it appeared the AMX name would also be laid to rest. Unfortunately that was not so. AMC must have been looking at the sales figures in the mid to late-1970s of the Trans Am and must have wanted in. AMC revived the AMX name on the Hornet for 1977, the Concord for 1978, and then moved it last to the Spirit in 1979. Though all three of these AMX cars had standard the 4.2 liter I6, they all could be had with AMC’s optional 304 CID V8 which made these smaller and lighter cars accelerate fairly well for their time period so at least the AMX name could be worn by these V8 variants with honor. The lack of a V8 option on the wild decal and spoiler laden 1980 Spirit AMX had taken its toll on the AMX name. Fortunately AMC saw the light and the AMX name was finally laid to rest at the end of the 1980 model year never to return. 4) 1976-1977 Oldsmobile 442 (260 CID V8) – Looking over the Oldsmobile 442 sales literature back in 1976 and 1977 would get any performance fan excited. After-all for 1976 a 455 CID V8 was still on the 442’s option list (though it was declawed compared to the Olds 455 V8s of a few years prior). And for 1977 the Oldsmobile (small-block) 403 CID V8 replaced the 455, still providing enough torque to move the 442 effortlessly even though horsepower had dropped from the 455’s figures. An Oldsmobile Rocket 350 CID V8 was also still available for 1976 and 1977. But what caught a performance fan’s attention was the offering of a new 5-speed manual transmission for the 442. Of course reading the fine print brought the excited reader back to reality (real quick I might add); the 455, 403, and 350 could not be had with the T50 5-speed manual transmission. It was instead reserved for duty with the base Oldsmobile 260 CID (4.3 liter) V8. On first reflection, one wonders how bad could this be – a 5-speed mated to a V8? However in this case the final product was bad (and not bad meaning cool). Oldsmobile’s 260 2 bbl. V8 arrived on the scene for 1975, it was intended to satisfy the fuel efficiency requirements of the late 1970s yet provide the smooth acceleration most Oldsmobile buyers expected. In essence the 260 V8 was to have the fuel efficiency of a V6 while still providing the smoothness of a V8. On this accord the 260 hit a homerun. However V6 fuel efficiency also meant V6 type power output and the 260 V8’s horsepower rating of 110 and measly torque rating (for a V8) of 205 lbs/ft were indicators this motor had no pulse. Even the 5-speed transmission could not make this dog of a motor feel performance oriented. Even though Oldsmobile offered the (105 horsepower) 3.8 liter V6 (another dog with fleas) on the 442 for 1977, the 260 V8 powered 1976-1977 442 makes this list due to it subjectively being the most underpowered V8 powered muscle car ever produced. The 260 V8 to its credit was a reliable motor and was found in wide assortment of cars from 1975 to 1982. However in an almost 4,000 lbs 1976-1977 Oldsmobile 442 (even with a 5-speed) it was far beneath par. Fortunately after 1977 the 442 continued on but the 260 would never again be a 442 engine option. By the mid-1980s a newer lighter much more powerful 442 would make the scene for a few years with a 170-180 horsepower 307 CID V8, the bad memories of the 260 V8 powered 442 were long gone. 3) 1982 Buick Grand National (4.1 liter V6) – The Buick Grand National needs no introduction, it was arguably the ultimate muscle car of the 1980s by its last two years in production. However back in 1982 before the Grand National went black, it was a two tone (silver and charcoal gray) ultra sporty two-door. Judging this book by its cover the Grand National looked tire smoking fast. However as your mother used to say “you can’t judge a book by its cover”, the first Grand National is a perfect example of why this is so. Standard on the Grand National was not a V8 or even Buick’s turbo V6, but the lowly 120 horsepower 4.1 liter V6. This was a hard pill to swallow especially considering the Grand National’s name had NASCAR roots. The only oval driving this car was good for was the suburban cul-de-sac. And to make matters worse there was not even a manual transmission option to show Buick was at least trying. 1982 happened to be the first year for the Grand National and it was a limited edition car with only 215 units being produced for the 1982 model year. Buick to its credit did offer its 175 horsepower 4 bbl. 3.8 liter turbo V6 as a Grand National option for 1982. Unfortunately it was not well advertised and very few were produced. Even today most people (even in Buick circles) don’t know a few 3.8 liter turbo V6 powered 1982 Grand Nationals were actually produced. Fortunately Buick took a break in 1983 and did not build a Grand National. The hiatus was good thing since Buick came back with a new (black exterior only) Grand National for 1984, which had standard a new Sequential Fuel Injection (SFI) turbo 3.8 V6. In 1986 the intercooler would be introduced. By the time Grand National production ended the turbo 3.8 liter SFI V6 produced 245 horsepower and 355 lb-ft of torque. It was the exact polar opposite of the low power 1982 Grand National. GM’s cancellation of the rear-wheel drive G-body platform forced Buick to cancel the Grand National at the end of the 1987 model year. 2) 1982 Mustang GT (4.2 liter V8) – 1982 was a great year for the Mustang GT, the GT name was revived after a thirteen-year hiatus (the GT name had been previously retired at the end of the 1969 model year). Ford for 1982 offered a bumped-up horsepower version of its 302 CID V8; the 5.0 liter 2V (2 bbl.) H.O. (High Output). This motor produced 157 horsepower and 240 lbs/ft of torque, which was very impressive for 1982. This hot motor was only available with a SROD 4-speed manual (overdrive) transmission. The bad news started when a buyer wanted an automatic transmission equipped GT, Ford only offered its low-performance (120 horsepower) 4.2 liter 2V (2 bbl.) V8. Fortunately most buyers steered clear of the automatic transmission/4.2 liter V8 combo. For those who were unlucky not to, they were left with a paper tiger – a slick looking performance car with no guts. The only advantage the 4.2 liter V8 powered GT had was good fuel efficiency. The 4.2 V8 could move the 3,300 lbs Mustang GT smoothly but that was it. It could have been worse Ford’s normally aspired 3.3 liter inline-6 or 2.4 liter 4 cylinder could have been the mandatory motor with the automatic transmission instead of the 4.2 V8 (After-all in Canada there were five engines available for the 1982 Mustang GT – the 2.4 liter inline-4, 2.4 liter turbo inline-4, 3.3 liter inline-6, 4.2 liter 2V V8, and 5.0 liter H.O. 2V V8). So at least in the American market Ford was trying. The ideal situation would have been for Ford to offer the hot 5.0 H.O. 2V V8 with the automatic transmission. Things did however improve for automatic transmission equipped Mustang GT for 1984-1985 (no automatic transmission was available for 1983) which came equipped with a 175-180 horsepower 5.0 H.O. CFI (CFI was Ford’s way of saying throttle body fuel injection) V8. However as good as this sounded the manual transmission equipped 5.0 liter H.O. 4V (210 horsepower) 1985 Mustang GT generated 30 more horsepower than the 1985 5.0 CFI H.O. GT. Finally in 1986 Ford got it right and made standard on both manual and automatic transmission equipped Mustang GTs the same hot 5.0 liter H.O. SEFI V8 (the SEFI 5.0 H.O. was a new offering starting in 1986). By this time the 4.2 liter V8 equipped Mustang GT was just a distant unpleasant memory. 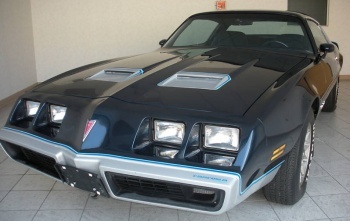 1) 1981 Firebird Formula (3.8 liter V6) – 1981 was not a good year for the Firebird Formula. First it was its last year in a successful run since 1970 (it would later on be resurrected in 1987). Second its base motor – the 301 V8 in 1980 was downgraded to a 120 horsepower Pontiac 4.3 liter (265 CID) 2 bbl. V8. And if that was not bad enough starting in March of 1981 the base motor was downgraded again to a Buick 3.8 liter V6 rated at 110 horsepower (190 lbs/ft of torque) due to the limited availability of Pontiac’s 4.3 and 4.9 liter V8s (since production of these two Pontiac V8s was to cease by end of the 1981 model year). The Formula which was a performance car from its 1970 model year inception was essentially a budget Trans Am, offering most of the Trans Am’s engine choices and handling goodies over the years in a slightly understated package (understated only when compared to the Trans Am). And by the late 1970s the Formula had its share of spoilers and wild decals that screamed high-performance. The 1981 Formula 3.8 liter V6 was a slap in the face to Pontiac performance loyalists. The owners of the 3.8 liter V6 Formula owned an automobile that looked the part, but these owners certainly feared the stoplight showdown. The 3.8 liter V6 had as much brawn as the 90 lb weakling at the local gym. And the muffled V6 sound when the throttle was mashed to the floor let everyone know this Formula was as menacing as Steve Urkle. The silver lining was the excellent gas mileage the 3.8 liter obtained. Even the heavy Formula when equipped with the 3.8 liter V6 could obtain close to 30 mpg on the highway. Who would have thought that possible for 1981? Then again one mash of the accelerator to the floor soon made you a firm believer that excellent gas mileage must have been the 3.8 liter V6 Formula’s only purpose. 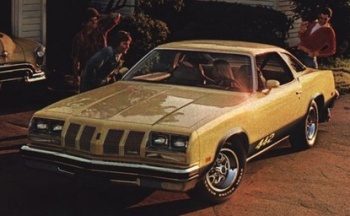 Fortunately Pontiac did not abandon its loyal followers for 1981; there was a 301 4 bbl. V8 option for those desiring a little more punch. And for those who wanted even more power, a 200 horsepower turbo 301 CID (4.9 liter) V8 was also on the Formula option list for 1981.